Taking the ferry from Ystad in Sweden - you are just one hour away from relaxation, unique nature and a lot of experiences. There is just something over Bornholm, which makes the island being predestinated for great holiday experiences. Maybe it is the Bornholm gastro, the varied landscape or the many sunshine hours. Nevertheless it seems, that time passes a little slower in Bornholms cosy and old fishing villages, than in other parts of Denmark. The islands suprises with locally produced foods of high quality, bright white sandy beaches, raw rocky cliffs, lots of cultural events – and an abundance of possibilities for active use of nature. They have been talking about Bornholm a couple of years now: The new gastronomic age, honoured chefs, local food products of high quality, that are combined to delicious dishes. Don’t miss out a unique food experience and taste the local delicacies. There are several award-winning chefs on Bornholm and good restaurants, where you will be served outstanding creations and where you don’t pay an overload of money. If you are more into a romantic “Dinner for two” in your summer house – then check out the many small sales booths along the streets, or visit the local food producers on the island. Many of them have a little farm shop, where you can buy firts class products. You could also visit the newly opened Market Hall Torvehal Bornholm in Rønne, that gathers some of the best Bornholm food producers under one roof. A sublime experience for all senses. You haven't been on Bornholm, if you haven't been to at least one of the typical Bornholm smokehouses or in one of the many good restaurants or cafés on the island. And you can make a warm summer night perfect by taking to one of the islands many bars or ice cream parlours. Take part in sports challenges, listen to good music, see award-winning chefs compete against each other - and much more. 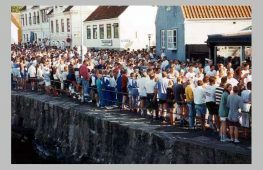 There are a lot of events on Bornholm all summer (please note, that you can translate the Danish speaking events by using the translate function on every eventpage).